WITH ALFIE | Journal - RINN Inc.
Alfie is a Chocolate Point Siamese cat. Abandoned at only two months old, Alfie and his younger brother Oskar were rescued and given refuge at the Pasadena Humane Society & SPCA in Southern California. Following an early morning soccer match in nearby Old Town Pasadena, artist and photographer Hamish Robertson visited the facility and knew the instant he saw the two kittens that he needed to bring them home. His wife, author Andi Teran, agreed. The feline brothers grew up together in the Los Feliz neighborhood of Los Angeles playing behind the pillows on the couch and chasing each other down the hallway. Sadly, after a fun-filled year of life, Oskar succumbed to an autoimmune disease and passed away peacefully leaving Alfie as the only cat. 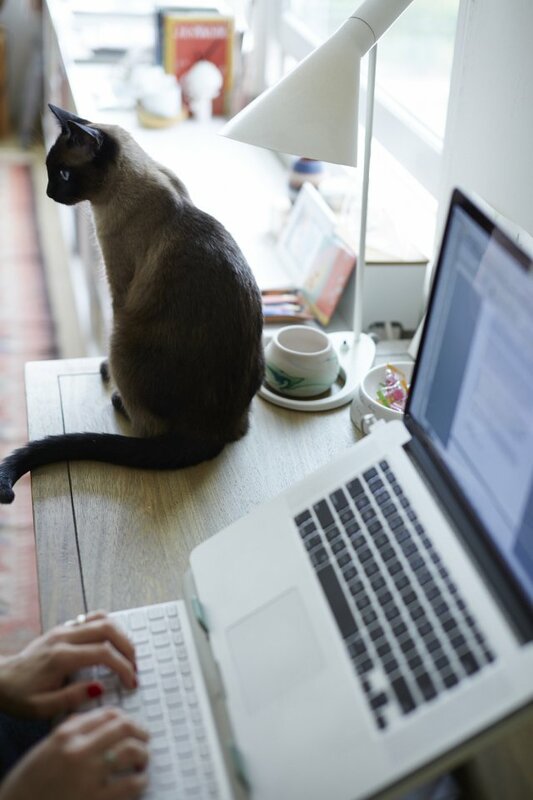 Now two years old, Alfie spends his days sitting at Andi’s side as she writes. Her new novel, Ana of California, is a modernization of the classic Anne of Green Gables. It takes place in both East Los Angeles and off Northern California’s Lost Coast. 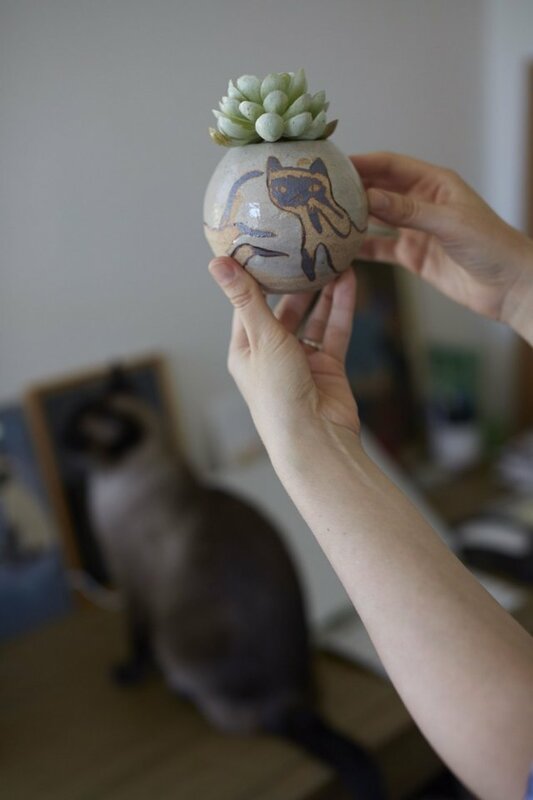 On Andi’s desk are cat art pieces given to her by family and friends. 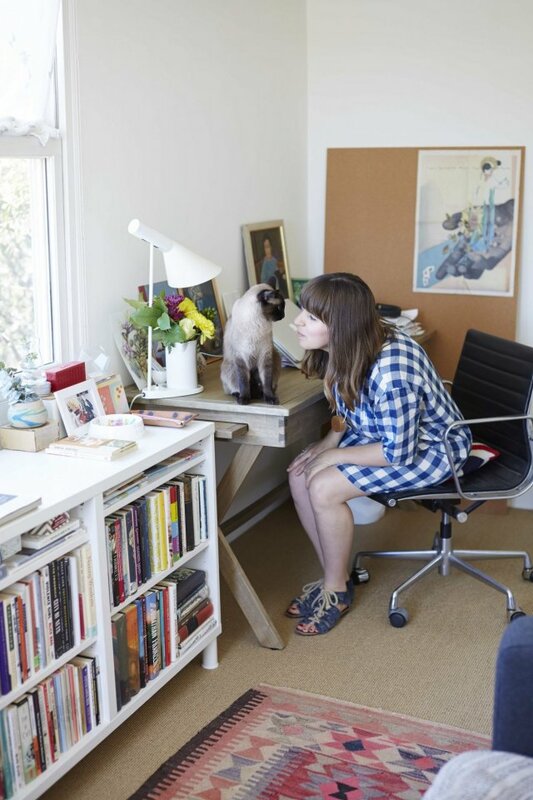 Her favorite is a portrait by Tokyo-based artist Mylan Nguyen who painted both cats on the cover of an old book. Nguyen also made two ceramic vessels that Andi fills with fresh flowers or office accessories. She has to be careful with Alfie, since he loves to eat flowers almost as much as he loves lounging in the early afternoon sun. Alfie also enjoys his evening time with Hamish. His favorite place to sit is in Hamish’s lap while he works. Though born and raised in Yorkshire, England, Hamish is inspired by his new home in California. His photography and artwork is heavily influenced by the surrounding nature and has been exhibited around the world. Hamish also designs and sells wearable accessories like scarves and pocket squares under his Vacation Days label. 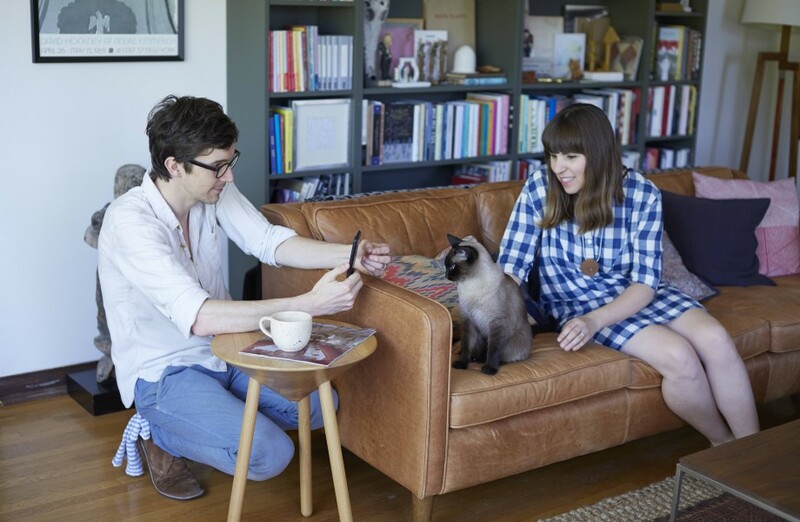 Together, Andi and Hamish make artworks like Andi’s Rock Monsters photo series, they print books and zines such as the cat-oriented Kittens and Kale, and they shoot short films. Their latest film, Conclusion, opened The Book Was Better® Film Festival in Rio Madre, California. Their home is a reflection of their work—shelves are full of books and surfaces are covered in art objects collected from their travels. The walls of their home are covered in art they make themselves or collect from places like the Rose Bowl Flea Market in Pasadena. Cat paintings and prints adorn their walls as well as an antique piano atop of which sits a portrait of Alfie by London-based pet artist Bessie Millar. Andi and Hamish both work from home while taking care of Alfie and his new “brother,” a baby born in the summer of 2015. The family enjoys simple suppers in their moss green dining room—Alfie always sits at the opposite end of the table—as well as quiet evenings watching the sun set from the picture window in their living room. Alfie the cat can usually be found sitting next to his favorite pal, a toy dinosaur.